January 18, 2019 / Modified jan 18, 2019 7:53 p.m. The teams will lead an intertribal group at the front of the march. People at the Tucson's Women's March as it passes by the Screening Room in downtown Tucson, Jan. 21, 2017. The Tucson Women's March returns to downtown on Sunday, and indigenous women will be taking the lead. At the very front will be teams who play toka, a sport played by women of the Tohono O'odham Nation and its sister tribes. Gabriella Cázares-Kelly is an educator and member of Indivisible Tohono, a group that focuses on civic engagement. Indivisible Tohono is coordinating the intertribal group that will have a designated space at the front of Sunday's event. She says people involved with organizing this year's march had been reaching out to her group for about a year. "Indivisible Tohono decided, 'Yeah, we're gonna do it.' We're really concerned with the idea of taking space, making space, creating space, transforming space ... So we're really interested in that, in being in spaces where it doesn't look like there's a space for us," she said. "If we are not there to share our story, then our story's not going to get told. We're going to be a part of that." Cázares-Kelly says the lack of inclusion of indigenous women has been problematic at previous marches. She described a complicated experience leading up to the 2017 march in Tucson — where she made her way on stage and spoke about the issue. She said a group of indigenous women walked away disappointed from an event in Phoenix in 2018. While the lead up to 2019's event hasn't been without controversy, she said, it's important to her group to show up. "These are things that as activists as community organizers everyone is trying to be better about. 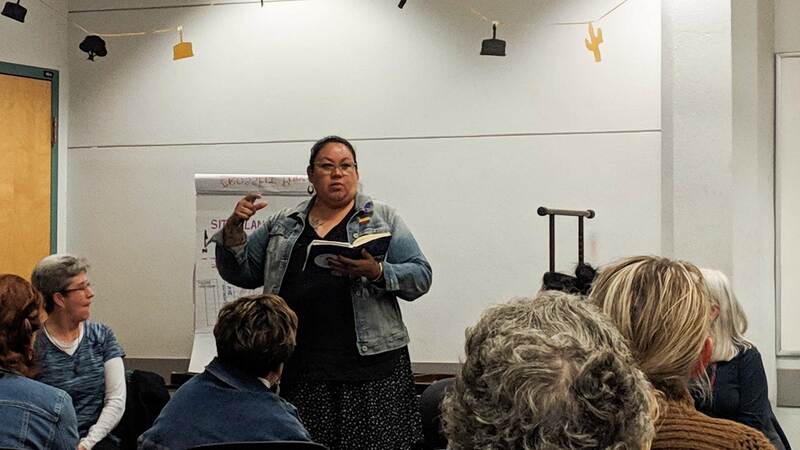 … The indigenous women's group we decided we're not yielding that space," she said, adding, "We want to keep pushing Tucson to do better." Tucson Women's March director Cynthia Bistrain, standing at left, opens a planning meeting. Tucson shares a bumpy road to inclusivity with other marches around the country, some of which have received criticism for lacking diversity. The national organization behind the Women's March in Washington, D.C., is reportedly struggling with a controversy over allegations of anti-Semitism. 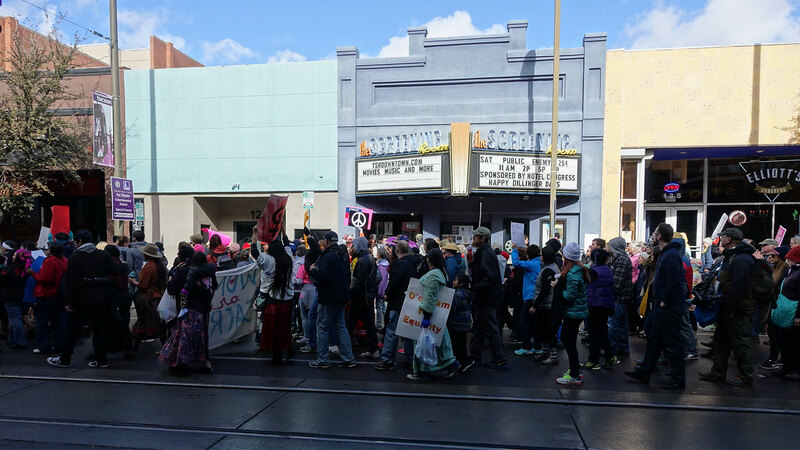 Organizers of the Tucson event say it has no formal or financial ties to Women's March Inc.
"The march is all about social change, about making our community a better place for all," said Cynthia Bistrain, the chair of this year's march. It's Bistrain's first time organizing. She says she was inspired by the 2017 event. "I really liked the feeling of empowerment, I'd never been to a march before, and what happened after that is I felt like doing more stuff, so I got a little more engaged in the community." Bistrain said she was appalled that Tucson didn't have a march in 2018. After asking around and reaching out on social media, she found herself in a leadership role for this year's event. Bistrain says much of the event has come together naturally through meetings all over town, and via conversations with those who showed up. "The march belongs to the community the way I see it," she said. "Most of the things have happened very organically. … We think about ourselves as pretty inclusive, but you know it's all relative. I know that there are people out there thinking that it's not very inclusive. "We just did the best we can," Bistrain said. 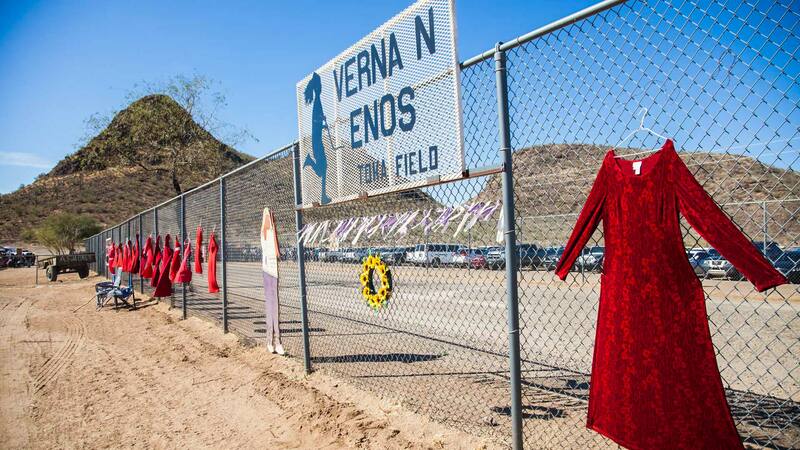 Red dresses and art hang on the perimeter of the Verna N. Enos Toka Field in February, 2018. April Ignacio is a member of Indivisible Tohono and organizes toka tournaments played at the Tohono O'odham Rodeo and Fair. She'll be speaking at the march about missing and murdered indigenous women, a key issue for her group. She says toka is a traditional game similar to field hockey, thought to be older than the saguaro, and played only by women, using materials harvested from the desert. Indivisible Tohono had already committed to participating in the march, but the decision to reach out to the toka teams, which come from different communities around the Nation, came later, said Ignacio, and it just made sense. 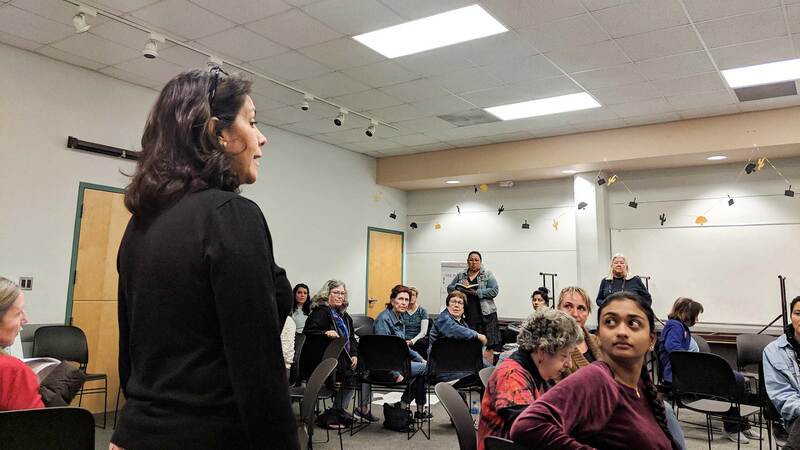 April Ignacio speaks to volunteers at the Tucson Women's March planning meeting. "These women are the protectors. They're also mothers and daughters. It just seemed like a no brainer, that these would be the women chosen to lead us as O'odham women," she said. "There's already an established sisterhood." "Toka itself was a game that was asleep. It was the efforts of women who supported each other and wanted something for the future. And they knew that they had to protect it, they knew they had to pass it on. They knew they had to lead, and they knew they had to teach it," Ignacio said. "Because it's a women's game, and only women play this game, and because we're in Tucson and this is O'odham jewed, this is O'odham land, that's how it fits in," she said. Cázares-Kelly says she sees the march as just one part of their group's larger efforts to access all kinds of spaces. "We just keep showing up, and we do that really because you know there's these conversations about having a seat at the table. 'If you're not at the table you're on the menu.' Well, indigenous people, we've been at a point where not only did we not have a seat at the table, we didn't even know which tables existed," Cázares-Kelly said. The Tucson Women's March starts at 10 a.m. Sunday at Jacome Plaza in downtown Tucson. Organizers said they expect around 15,000 participants, and Ignacio says upwards of 200 toka players could be present to start the march. This story has been corrected to say that Cynthia Bistrain is the chair of the 2019 Tucson Women's March. 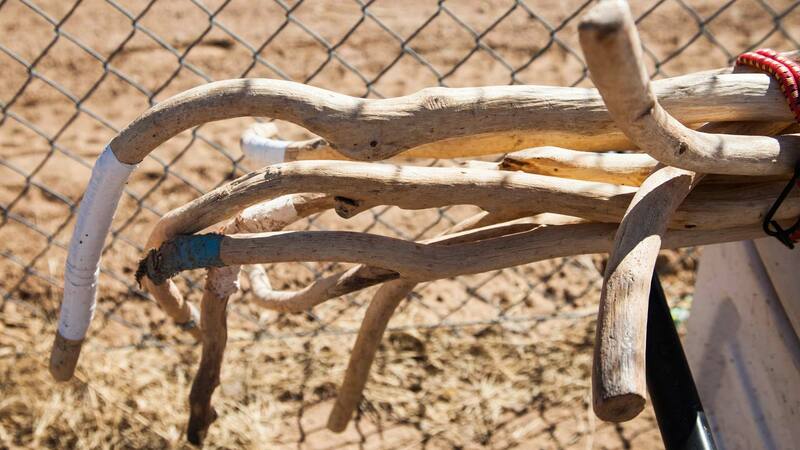 U'usaga, the instruments used to play toka, are mesquite branches that are stripped, shaped and hardened.